Well, we usually use the last expansion thread for that. In this case, this thread. Okay, so on previous page I posted the "representation" of card types and rarity percentages. Now, I am going to post the actual probability of getting a card type in the various packs of each set. 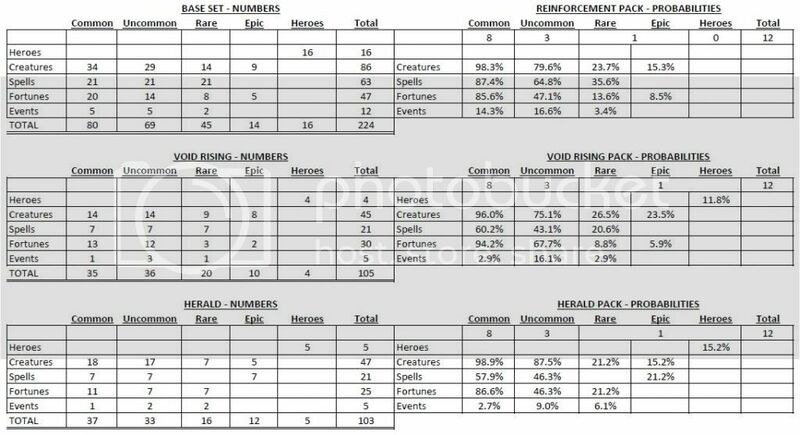 As packs have 8 commons, 3 uncommons, and 1 rare/epic & hero, there percentages vary. For example, common card types have 8 "chances" of appearing so we need to perform the probability with 8 attempts without replacement. For rare/epic/hero card there is only one attempt so the probability is a percentage of total rare/epic/hero cards. As you can see, the highest probability is a common creature from the herald pack (98.0%) and the lowest probability is the rare event card from the void pack (2.9%). Edited by dale at 06:30, 17 Aug 2013. I have played most of the HOMM & M&M games, plus a lot of other turn based RPGs. I have done all I can do with my current version of HOMM VI, and just happened to notice a mention about DoC. I've decided to give it a try, and would share my initial impressions and a few newbie questions. First impression, it is different but I like it. Many of the same creatures, etc. so there is some familiarity. I've read through some of the forum posts, both here and on http://forums.ubi.com/forumdisplay.php/394-MMDOC-Global , including a very good FAQ written by Robvalue and pointed to in several places. I am having a bit of difficulty in the opening tutorials and the single duel I have played, but suppose that is to be expected. In the later tutorials, it has taken me multiple starts to finally win the battle -- especially the Craig Hack one. The only real question I have so far has to do with putting cards into my deck. I have bought "the box" and some reinforcement packs. When I go to open these, I get a display of sixteen cards. Some are yellow -- which looks like I can click on them and enter them into my collection of cards. Others are red -- and seem not to be available for me to add to the collection. The question is -- are those red cards then gone forever, or are they hanging around for when I might have a different hero faction to create a new deck and collection? The single duel I played matched me (ELO 0) against a person with ELO 20. I lost, but managed to get enough XP to carry on with the final tutorial campaign. My question here is: As an ELO 0, what is the maximum ELO I might get in my duel requests. When you open a pack, the yellow cards signify that they are the first time to get them. In the deckbuilder you can filter cards by set(base, void rising, herald of the void), by rarity(common, uncommon, rare, epic), premium and finally by new. If you click new all the yellow cards will appear, unless you have already clicked them, their yellow outline disappears then. All cards should be displayed properly but if you have your deck open, those you cannot include will show as red. Not to worry they will never leave your collection but you will need a different hero to use some of those. As for the elo, I have personally been matched with a 400+ elo range so don't pay much attention to it. Elo matchmaking is bad. Normally though the range should be +-200. PS check the masterpost, I have redeem codes for free packs. Some of the earlier ones might not work in which case I'd like you to tell me which but the rest work just fine. There is a redeem option in the shop, ingame. I'm sure I will find those -- and hopefully learn from the mistakes. Not to worry they will never leave your collection but you will need a different hero to use some of those. Thanks for the explanation. You have relieved my concern. I have found and tried the codes in the opening post of this thread, as well as a few others mentioned here. Some of them worked, and some did not -- but I did not keep record of which ones. In addition, I have found the following two codes elsewhere (probably the MMDOC forum). Again, I did not record if they worked or not, but I don't think that they did. You get 100 seals and 10000 gold for every level up. For every level up you need 20000 XP. Endurance bonus = starts at 290 XP (reach turn 5) and goes up as you reach each turn (e.g. turn 9 gives you 410 XP). So if your win rate is 70%, it will take approx. 40 duels to level up! [400 + 320 ave = 720 x 70% = 504 XP. It is not possible that you need just 20000 XP for every level? I need a ton more games now for level 59 than I needed for level 20 for example, I am pretty positive about it. Edited by The_Polyglot at 20:43, 06 Sep 2013. Gives a premium Herald pack. Seems it was official so it should stay Added to the masterpost. Of course it was official, did you think I hacked the game or something? Edited by The_Polyglot at 15:22, 09 Sep 2013. EDIT: Jason said it expires today! Grab it while You can! Thanks for that one - a couple of killer cards for me actually. Actually, level up requirement is less than 20,000 XP up until at least level 90. Correct, I was refering to post 90 level....but nonetheless the above link to Ubisoft forum is a good chart and very accurate! Thanks, Poly! It's a great code and it still works today on the 10th. Too bad I didn't get any good cards, perhaps I have them all but The Forbidden Flame... And the stock deck can be awesome for anyone interested in a Sanctuary Fortune Control deck... meh. Something you should be aware of..
A few months ago someone hacked ubi and there was a public warning to change our passwords just in case. Mere days ago someone's account was hacked and all of his cards were sacrificed in the pit!! I cannot know if those events are interlinked but I'd recommend that you change your password. Chances are someone didn't like him but one can never be too careful..
Oh.. Thanks for the update.